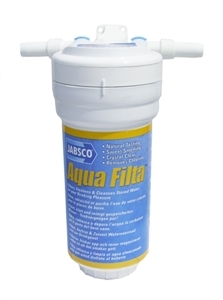 Jabsco Aquafilter - Complete unit. Filters, Freshens and Cleanses Stored Water. Jabsco Aquafilter - Complete unit. Filters, Freshens and Cleanses Stored Water. Removes Chlorine, Sweet Smelling Crystal Clear Water, Natural Tasting.